You may have never heard of it, or you may be a convert. Kombucha, a fermented drink derived from green tea, is certainly causing a stir in the natural health industry. Our mission is to provide you with both insightful information and evidence-based content to provide you with actionable knowledge and tips you can trust, to help you on your journey to optimal health. This article looks at some of the health benefits of kombucha. What Does Kombucha Taste Like? What are the Health Benefits of Kombucha? Are There any Downsides to Kombucha? Can I Make Kombucha at Home? Is Kombucha Suitable for Everyone? Kombucha has a long history, despite being a relative newcomer to health-store shelves in the West. It’s been around for more than 2000 years. The first recorded instance of the consumption of kombucha was by a Chinese Emperor as far back as 220 BC. The ancient Chinese dubbed it the ‘Immortal Health Elixir’. Kombucha has been known by many different names over its history. The Chinese called it variously Manchurian Tea or Kargasok Tea. As the story goes, it was given its name kombucha after a Korean physicist Kombo who gave it to the Japanese Emperor. The Chines character for tea is pronounced ‘cha’ - so the name literally means Kombu tea. Kombucha later became popular in Russia where it was called tea kvass. Eventually, it reached America where even Ronald Reagan was a convert. Here in the UK, it’s fast becoming the next big thing in hip bars and high-end restaurants, and it is available in an array of tempting flavours. The starting point is sweetened black or green tea. This is fermented with a special culture containing various strains of bacteria and yeast. This starter culture goes by the odd name of SCOBY which stands for ‘symbiotic culture of bacteria and yeasts’. The mixture is left to ferment for at least a week. During the fermentation process, the bacteria and yeasts convert the sugar into ethanol and organic acids such as acetic acid. It’s the acetic acid which gives kombucha its distinctive sour taste. Also produced are small amounts of alcohol as well as gases which make it fizzy. During fermentation, the bacteria and yeast form a film on the surface which looks a bit like a mushroom. This is why kombucha is also known as "mushroom tea." 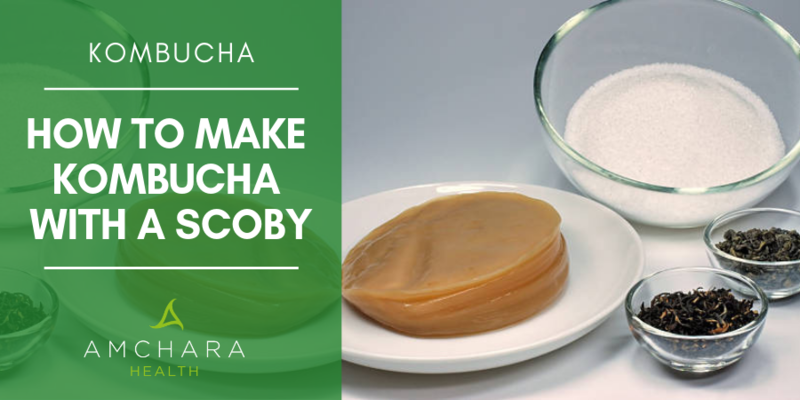 Once the kombucha is ready the blob of SCOBY will have increased in size and can be used to ferment successive batches of green tea over and over again. Traditionally the culture is often given away as a gift, so the recipient can start a new batch of kombucha. The taste is slightly sweet but also tart, and lightly fizzy. Kombucha is often flavoured with spices or fruits. These make it more palatable as anyone who has tried kombucha will know it’s an acquired taste. Kombucha is called a functional food owing to its potential health benefits. Anecdotally, it’s been said to offer protection from a whole range of degenerative diseases. In the early 1900s, a folk-remedy called ‘Brinums-Senes’ was popularly drunk in Latvia. The name translates as ‘wonder-mushroom’, so it’s believed to have been kombucha. It was reported to be effective against many diseases from fatigue, digestive ailments and joint problems to cardiovascular disease. Kombucha was the subject of much early research in both Russia and Germany. In later years, advances in knowledge about kombucha were largely hidden from the West because of the Cold War. In recent years, little research has been carried out on kombucha apart from a few anecdotal surveys by food companies which manufacture kombucha. This is typically because the drug industry has no potential to gain from researching a beverage which is relatively cheap to make and buy. As with any traditional fermented remedy, the exact constituents of kombucha won’t be exactly the same each time it’s brewed, making consistent scientific research and evaluation problematic. However its benefits are well known to the alternative health world. 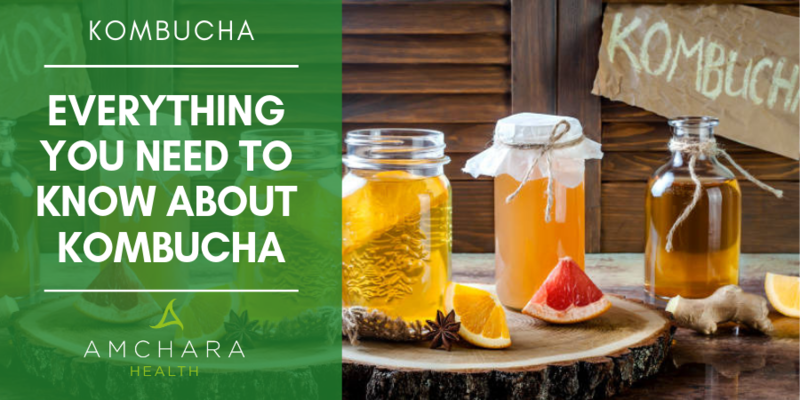 Kombucha owes some of its beneficial properties to the green tea which is the starting medium, but we’re now starting to discover fermented foods and beverages have powerful abilities to support health. Once fermented, kombucha contains a whole host of other beneficial substances in addition to those found in green tea. We can examine the results of research on these substances to extrapolate its likely health benefits. Because kombucha is a fermented drink, it contains probiotic bacteria such as lactobacillus (1). These can help balance the gut microbiome and so improve digestion and immunity and reduce inflammation. Antioxidants protect the body from oxidative damage caused by free radicals, which are natural by-products of our metabolism. Green tea contains high levels of antioxidants called polyphenols. It appears the longer kombucha is fermented, the more antioxidant activity it has (2). Once green tea is fermented into kombucha, it contains substances called organic acids. These are mainly composed of acetic acid, which is also found in apple cider vinegar, but also citric, malic, glucuronic, lactic, hyaluronic and butyric acids. It also contains beta-glucans, as well as substances from which the body can make glucosamine. Some nutrients are produced naturally when the bacteria and yeast break down the sugars. These include vitamin C and trace amounts of the B vitamins B1, B6 and B12. The acetic acid content of kombucha means it possesses antibacterial activity (3). Interestingly, during fermentation, the growth of undesirable bacteria and yeasts is suppressed, while the probiotic bacteria and yeasts involved in the fermentation of kombucha are unaffected. Kombucha contains plenty of organic acids, such as glucuronic acid. This is produced naturally by the liver and is believed to play a role in detoxification. Animal studies have found drinking kombucha can significantly reduce liver toxicity. Kombucha contains the building blocks from which glucosamine and hyaluronic acid are made. These are often taken as supplements to prevent and manage arthritis. Glucosamine is an amino sugar which is concentrated in the joints. It’s believed glucosamine helps protect the cartilage in our joints. Hyaluronic acid is found in connective tissue and helps our joints retain moisture and therefore remain lubricated. Kombucha is a probiotic drink, so it plays a role in the maintenance of our friendly digestive bacteria. We know a healthy digestive system is crucial not only to avoid IBS, diarrhoea and constipation but for overall body health. Butyric acid is a short-chain fatty acid which is thought to play a beneficial role in the digestive tract. It provides fuel for the cells lining the intestine and promotes healing. Anecdotally, kombucha has been reported to ease constipation. The health of the immune system is closely linked to the health of our gut flora, so anything which improves our intestinal bacteria will benefit our immunity. Kombucha is also believed to contain beta-glucans as a result of fermentation. These play a role in our immune response, in particular stimulating the production of macrophages, a type of immune cell which attacks foreign invaders. In animal studies, kombucha reduced levels of LDL (bad) cholesterol and increased HDL (good) cholesterol levels after one month (3). Green tea polyphenols are known to protect LDL cholesterol from oxidation. Oxidised cholesterol is linked to heart disease. Drinking green tea has been shown to reduce blood sugar levels, and studies have noted green tea drinkers are less likely to be diabetic. Anecdotally, kombucha has been reported to aid weight loss, although research is lacking to support this. Some research suggests certain antioxidants called catechins found in green tea may increase the rate at which fat is metabolised from cells and burnt for energy. More research is needed in this area. It’s been reported drinking kombucha improves energy levels during exercise as well as speeding post-workout recovery. Soviet Olympic athletes drink kombucha to reduce sore muscles post-workout. Kombucha may help by increasing the clearance of lactic acid from muscles after exercise. It’s even been claimed kombucha can help us avoid cancer. The Russian writer Alexander Solzhenitsyn believed it helped him ward off stomach cancer when he was held prisoner in Soviet labour camps. One interesting piece of research found kombucha helped prevent the proliferation of cancer cells in vitro (5). This was most likely due to the high levels of green tea antioxidants it contains. It’s thought habitual green tea drinkers are less likely to develop certain cancers. It would be interesting to see more research in this area, particularly to discover whether kombucha confers any benefits over and above those we know are offered by green tea. Sugar is used in the fermentation process. It’s used as fuel for the fermentation medium and decreases as fermentation proceeds. It should be mostly used up by the bacteria by the time you drink it, as long as the tea is allowed to ferment for long enough. If kombucha is fermented for only a short time, there may well be residual sugar remaining. Green tea naturally contains caffeine, although it’s believed the caffeine content decreases as fermentation proceeds. A small amount of alcohol is naturally produced by the fermentation process. It’s usually only a trace, between 0.2% to 1.2%, although homemade kombucha generally contains a bit more. To put this into perspective, an overripe banana will contain around 0.1% alcohol. Kombucha can be made cheaply at home by obtaining a starter culture and reusing it time and time again. The SCOBY constantly grows each time it’s used. 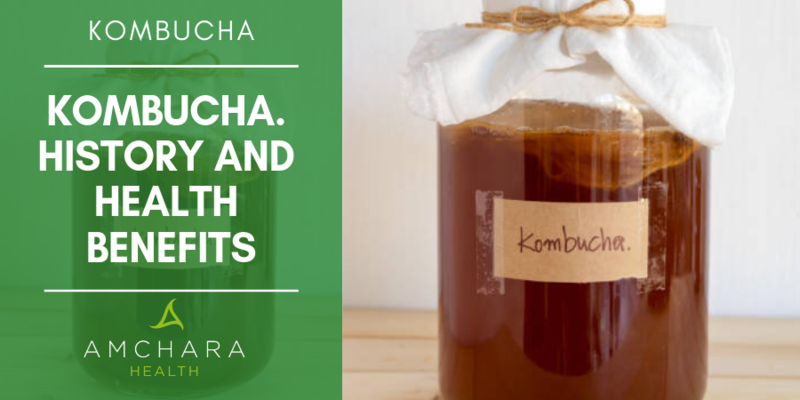 As with any fermented products, if you made kombucha yourself it’s important to take precautions to ensure utensils are clean, otherwise, it can become contaminated by harmful bacteria. It’s important when choosing shop-bought kombucha to avoid ones with added sugar. It’s also best to avoid kombucha which has been pasteurised, as this will kill the beneficial bacteria. Kombucha is not recommended for pregnant or breastfeeding women, or for people with a compromised immune system. If you’re curious about kombucha, why not give it a try? Its array of ingredients certainly pack a health-giving punch. We hope you enjoyed this article. Have you tried kombucha? We’d love to hear your thoughts.